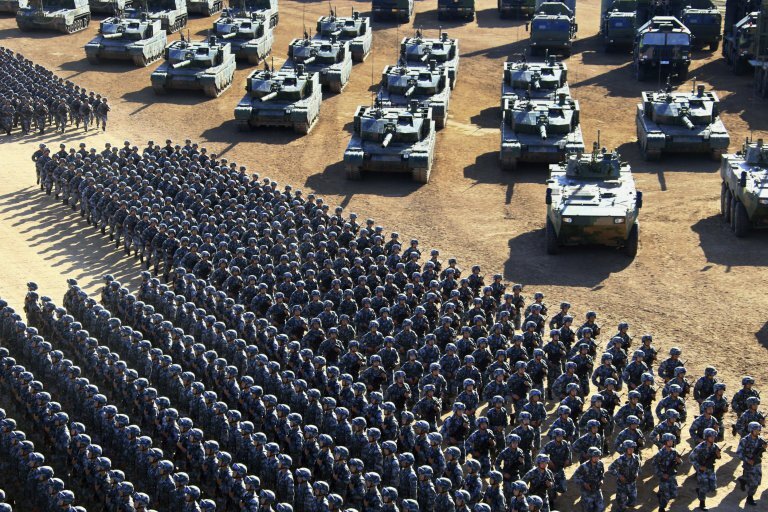 China has revealed the full extent of its military might – and it’s fairly terrifying. President Xi Jinping inspected troops personally at a parade which featured stealth jets, nuclear missiles, attack helicopters and more than ten thousand of soldiers. The large-scale military parade showed off the forces at the President’s command to foreign and domestic audiences, just hours after a warning to Donald Trump about US involvement in North Korea. China’s armed forces have the ‘confidence and capability’ to bolster the country’s rise into a world power, President Xi Jinping said on Sunday. Live state television broadcasts showed Xi, dressed in fatigues and speaking from an open-top jeep, telling his troops that China needed a strong military ‘more than ever’ as it moved ‘closer to the goal of the great rejuvenation of the Chinese nation’. Xi, who commands the People’s Liberation Army as chairman of the Central Military Commission, has frequently spoken of his ‘China Dream’ to restore the nation to a leadership position in international affairs with a modern, far-reaching military force to match. The parade, at the Zhurihe military training base in China’s Inner Mongolia region, also heard Xi’s declaration that the PLA are ready to defeat all ‘invading enemies’ as he celebrated the 90th anniversary of the PLA’s founding. It was the first time a parade has been held to mark the occasion. ‘We need to build a strong people’s military more than any other time in history,’ Xi said, who served briefly in the military as an aide to the defence minister and last year assumed the title of commander in chief of the military’s Joint Operations Command Center, whose insignia he wore on the camouflage battle dress. The forces addressed him as ‘Chairman Xi’ as they rumbled past. The parade was blanketed by state media coverage and streamed for foreign audiences on YouTube, which is blocked inside China. A new Dongfeng-31AG variant of the nuclear-tipped intercontinental ballistic missile and the Dongfeng-21D ‘carrier killer’ was on display, along with multiple H-6K bombers, the long-range aircraft recently involved in exercises near Japan and the South China Sea, were shown flying by overhead. On Sunday, Xi issued another call for loyalty as he instructed his amassed 12,000 troops to ‘unswervingly stick to the fundamental principle and system of the party’s absolute leadership over the army,’ the official Xinhua News Agency reported.